The aim of this study was to determine the effect of everolimus and tacrolimus pretreatments on renal morphology and function in a rat ischemia reperfusion (I/R) model. Twenty-eight male Sprague-Dawley rats were randomly assigned to saline + sham operation, saline + I/R (IR), tacrolimus + I/R (TRL + I/R) and everolimus + I/R (ERL + I/R) groups. Saline and active treatments were administered intraperitoneally for seven consecutive days before the surgery. The suprarenal aorta was clamped to achieve warm ischemia, except in the sham group. Right nephrectomy was performed in all animals and histology was examined. Renal function was assessed on post-operative Day 7 by Tc-99m dimercaptosuccinic acid (DMSA) scintigraphy, glomerular filtration rate (GFR) and serum biochemistry. Both everolimus and tacrolimus preserved serum creatinine and blood urea nitrogen levels, but only everolimus preserved GFR (0.74 ± 0.36, 1.20 ± 0.37 and 2.24 ± 0.32 mL/min for I/R, TRL + I/R and ERL + I/R, respectively, P < 0.001). %ID values for sham, I/R, TRL + I/R and ERL + I/R were 55 ± 3, 47 ± 4, 45 ± 6 and 62 ± 7 (P < 0.001). On histologic evaluation, ERL + I/R showed less tubular damage and necrosis than I/R, as well as TRL + I/R. Within the confines of this rat warm ischemia model, everolimus pre-treatment was useful in preserving renal function following I/R injury. The possibility of using everolimus as a pre-conditioning agent for I/R injury in kidney transplantation should be further explored. We aimed in this study to use a rat model of I/R injury to determine the effect of everolimus and tacrolimus pre-treatments on renal morphology and function, which was assessed by serum biochemistry, GFR and Tc-99m DMSA scintigraphy. The study was conducted at the laboratory of animals care unit in accordance with the guidelines for the care and use of laboratory animals established by the Animal Ethics Committee, which approved the study design in our institute. Twenty-eight male Sprague-Dawley rats aged six to eight weeks, weighing 280 ± 20 g, were included in the study. 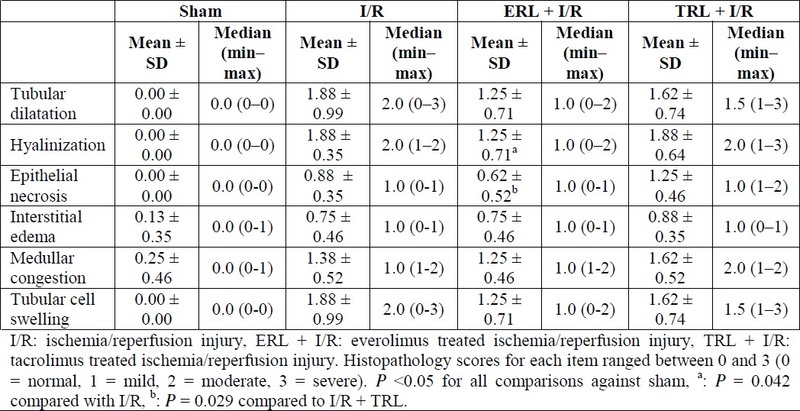 Using a computer-generated table of random numbers, rats were assigned into four groups: Sham operation (Sham, n = 7), ischemia/reperfusion injury (I/R, n = 7), everolimus treatment + ischemia/reperfusion injury (ERL + I/R, n = 7) and tacrolimus treatment + ischemia/reperfusion injury (TRL + I/R, n = 7). The animal room was maintained at a temperature of 22°C ± 2°C and a relative humidity of 55% ± 15%, with a 12-h light-dark cycle. Tap water and chow were freely available throughout the acclimatization and study periods. After an overnight fast, the rats were anesthetized using 5 mg/kg of xylazine and 30 mg/kg of ketamine hydrochloride intramuscularly before the experiment. The abdomen of each animal was shaved and cleaned with the povidone iodine solution. Using the sterile technique, all animals underwent laparotomy through a 3 cm midline incision. The aorta and the visceral arteries were exposed via the abdominal cavity. The sham group underwent suprarenal aorta mobilization without clamping of the aorta. In groups I/R, ERL + I/R and TRL + I/R, an atraumatic microvascular bulldog clamp was placed through the suprarenal aorta of the animals. The duration of the induced ischemia was 45 min. Confirmation of ischemia was done by visual inspection of both kidneys. Five minutes before clamp removal, right nephrectomy was performed. The midline incision was sutured. The rats were placed back into their cages and recovery of the experiment was monitored. No further intervention was done to the rats in the sham or the I/R group. In the ERL + I/R and the TRL + I/R groups, the treatment protocol was continued on postoperative Day 1 until the end of the study on post-operative Day 7. The animals were placed into individual metabolic cages for 24 h after performing the renal ischemia (metabolic cages, R-2100, Lab Products Inc. Seaford, DE, USA). Urine samples were collected, free of food and feces, into graduated cylinders. Urine volume, urea, creatinine, osmolality and GFR levels were assessed in all the groups at the end of the reperfusion periods (at 24 h of reperfusion). The GFR calculation was based on endogenic creatinine levels. Blood sample was collected and interrupted the metabolism via a right ventricular puncture to the heart. Serum blood urea nitrogen (BUN), creatinine (Cr), alanine transaminase (ALT), aspartate transaminase (AST) and gamma-glutamyl transpeptidase (GGT) levels were assessed in all the groups. DMSA scintigraphy was performed on postoperative Day 7. A dose of 1 mCi of the isotope was injected through the tail vein of the rats using a 24F catheter while they were under general anesthesia. 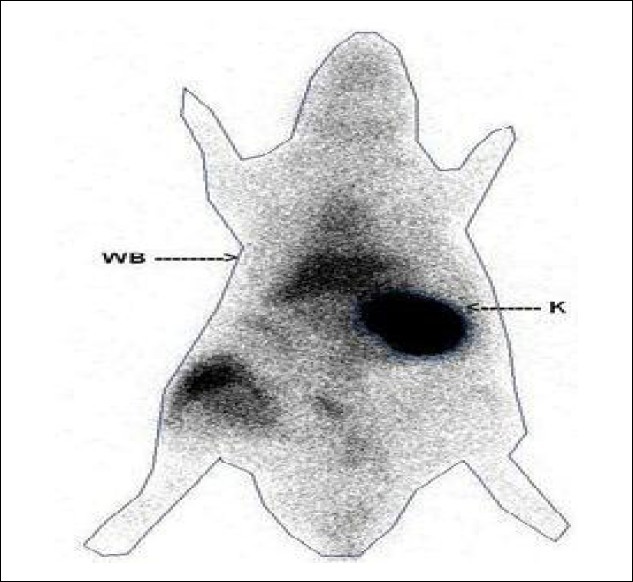 Whole-body imaging of the rats was carried out 2 h after DMSA delivery, with a single-head gamma camera using a low-energy, general purpose collimator at 1.55× zoom, 512 × 512 matrix, 300 s. Semiquantitative evaluation was performed by drawing the regions of interest (ROI) for the whole body of the rat (WB) and the left kidney [Figure 1]. A background correction was achieved through pixel counts in an area outside the body of the rat. The kidney function was estimated by the percentage of the injected dose (%ID), calculated as back-ground-corrected kidney counts divided by background-corrected whole body count, multiplied by 100. Figure 1: The selection of regions of interest for the whole body and left kidney on Tc 99m DMSA whole body (WB) imaging of rat. The harvested kidneys were fixed in 10% formalin for 24 h, then embedded in paraffin and cut into 5- m sections. The slides were stained with hematoxylin and eosin (H&E) and examined under a light microscope. Each slide was evaluated by an expert investigator blinded to the experiment and data. Samples were examined for renal impairment in terms of tubular cell swelling, interstitial edema, medullary congestion, tubular dilatation and epithelium necrosis. They were scored as normal, mild, moderate and severe (graded 0-3) according to the level of injury. Data are expressed as mean ± standard deviation. The group means were compared using the Mann-Whitney U test. Categorical histopathology results were compared by using the Fischer Exact test. Statistical significance was determined as P <0.05. 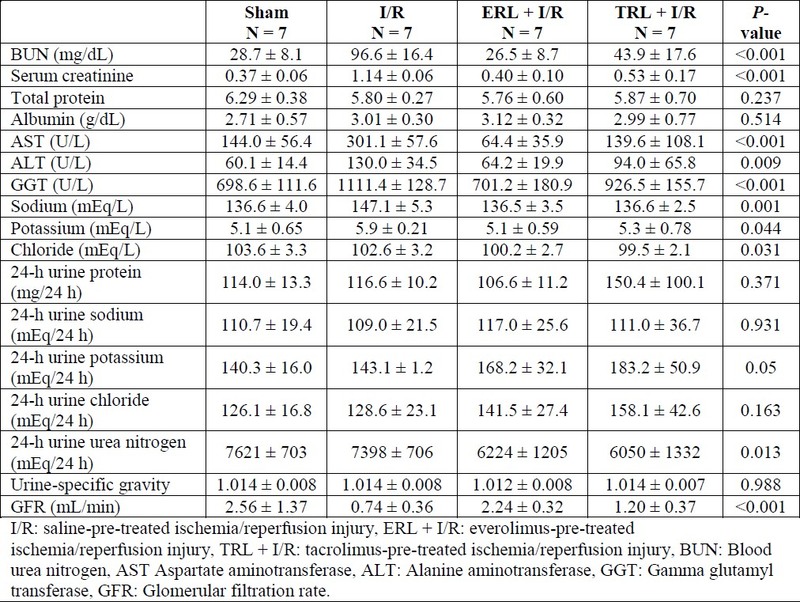 The serum biochemistry tests performed 24 h after I/R injury showed a significant increase in serum creatinine and BUN for the I/R group, while the ERL + I/R and TRL + I/R groups had levels similar to the sham controls [Figure 2], [Table 1] and [Table 2]. The I/R group had significantly increased AST, ALT, GGT and Na levels, while only GGT was significantly increased in the TRL + I/R group and all the serum parameters were in the normal range in the ERL + I/R group [Table 1] and [Table 2]. Both the ERL + I/R and the TRL + I/R groups had significantly better BUN, serum creatinine, AST and sodium compared with the I/R group, but only the ERL + I/R group had significantly better GFR compared with the I/R group [Table 1] and [Table 2]. Figure 2: Serum creatinine (Cr) and blood urea nitrogen (BUN) increased significantly in the I/R group, but not in the ERL + I/R and TRL + I/R groups. Error bar represents standard deviation. Table 1: Blood and 24-h urine biochemistry of sham, I/R, ERL + I/R and TRL = I/R groups compared by ANOVA. Table 2: Post hoc analysis: P values for comparisons of I/R, ERL + I/R and TRL + I/R biochemical parameters against Sham and ERL + I/R and TRL + I/R parameters against I/R. The GFR was significantly decreased in response to I/R injury compared with the sham controls [Figure 3], [Table 1] and [Table 2]. In the TRL + I/R group, the GFR was not significantly improved compared with the I/R group, remaining significantly lower than the sham controls [Figure 3], [Table 1] and [Table 2]. On the other hand, in the ERL + I/R group, the GFR was significantly improved compared with the I/R group, reaching levels similar to the sham controls [Figure 3], [Table 1] and [Table 2]. Figure 3: Glomerular filtration rate (GFR) based on endogenous creatinine levels. ERL + I/R had significantly higher GFR compared to I/R and TRL + I/R groups. GFR of ERL + I/R group was not significantly different than sham operated group. Error bar represents standard deviation. In the Tc-99m DMSA scintigraphy, the %ID was reduced in the I/R group compared with the sham controls, although the difference was not statistically significant (I/R, 47 ± 4 vs. sham, 55 ± 3; P = 0.134). In the TRL + I/R group, no improvement in the radionuclide retention could be seen compared with the I/R groups (TRL + I/R, 45 ± 6 vs. I/R, 47 ± 4; P = 1.000). However, the ERL + I/R group had a significantly increased radionuclide retention, suggesting an improved function (ERL + I/R, 62 ± 7 vs. I/R, 47 ± 4; P = 0.001) [Figure 4]. Figure 4. Tc-99m DMSA scintigraphy results. Kidney function was estimated by % injected dose (%ID). ANOVA showed a significant difference between the groups (P < 0.001). %ID was reduced in the I/R and TRL + I/R groups, but the difference was not significant compared with sham (P = 0.134 for I/R and P = 0.081 for TRL + I/R). ERL + I/R was not significantly different compared with sham (P = 0.497). Error bar represents standard deviation. The sham-operated kidneys had normal histology, with mild interstitial edema seen in only one rat and mild medullary congestion seen in two of the eight rats. The I/R injury resulted in moderate tubular dilatation, hyalinization and tubular cell swelling with mild necrosis, interstitial edema and medullary congestion [Table 3], [Figure 5]. The TRL + I/R group also disclosed moderate tubular dilatation, hyalinization, medullary congestion, tubular cell swelling and mild necrosis and interstitial edema. Finally, the ERL + I/R group showed only mild damage on all aspects of the pathological examination [Table 3], [Figure 5]. Statistical analysis of the mean of the histopathological scores showed significantly higher scores for the I/R, ERL + I/R and the TRL + I/R groups compared with the sham group. However, ERL + I/R group showed significantly less hyalinization compared with the I/R group (P = 0.042) and significantly less epithelial necrosis compared with the TRL + I/R group (P = 0.029). Figure 5. 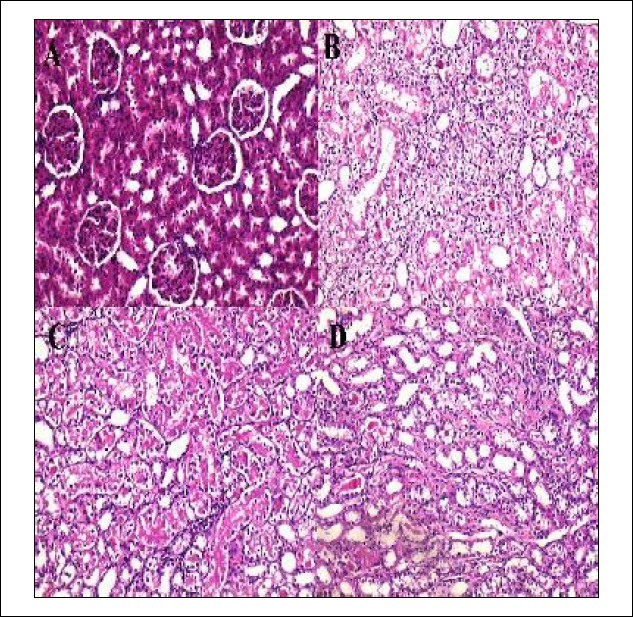 (A) Microscopy showing normal histology of the kidney in the sham group (H&E ×100), (B) renal histopathology of the I/R group demonstrating extensive hyaline cast for-mation and epithelium necrosis (H&E ×100), (C) renal histopathology of the TRL + I/R group showing moderate hyaline cast formation and epithelium necrosis (H&E×100), (D) renal histopathology demonstrating mild epithelium necrosis and hyaline cast formation in the I/R + ERL group (H&E ×100). Table 3: Renal histopathology scoring of sham, I/R, ERL + I/R and TRL + I/R animals. In the present study, a rat warm ischemia model was investigated to determine the effect of one week of tacrolimus or everolimus pretreatment prior to I/R injury on kidney function and histology. The data of the present study demonstrated that everolimus 1 mg/kg pre-treatment provided a significant protection against I/R injury based on a number of evaluation criteria, including serum creatinine and BUN levels, GFR, renal scintigraphy and histology. The effect of immunosuppressive drugs on I/R injury is much debated. In most experimental studies, renal function is assessed by serum creatinine and BUN, leading to conflicting results depending on factors such as dosage, delivery time and ischemia model. Many studies of rat models of warm ischemia with low-dose tacrolimus or cyclosporine pre-conditioning of the kidney prior to I/R showed it to have a protective effect on renal function based on serum creatinine and BUN. ,, However, other studies determined that the use of immunosuppressive agents such as tacrolimus, cyclosporine or sirolimus at therapeutic dosages resulted in elevated serum creatinine. ,, In addition, Cacciarelli et al  reported that the serum creatinine levels in-creased regardless of the timing of tacrolimus administration, before or after induction of I/R injury. Fuller et al  used a rat kidney transplant model to determine the effect of sirolimus following 24-h cold ischemia and syngeneic transplantation. The authors showed that sirolimus administered immediately after reperfusion delayed recovery of graft function based on serum creatinine and histology results. On the contrary, in a recent orthotropic kidney auto-transplantation study, Cicora et al  found that one dose of immunosuppressive agents (sirolimus, mycophenolate mofetil or tacrolimus) delivered 12 h before the surgery improved serum creatinine and BUN as well as renal histology compared with no treatment. A special aspect of our study is the use of Tc-99m DMSA scintigraphy to assess renal function in addition to GFR and serum creatinine. We hypothesized that Tc-99m DMSA scintigraphy may give additional information on renal function as DMSA uptake depends mostly on the peritubular function instead of filtration and I/R affects primarily the proximal tubular area. ,, In a recent study, Tc-99m DMSA scintigraphy was employed in the different renal I/R mice models to determine their renal repair capacity, suggesting that DMSA scintigraphy may be a useful tool in the assessment of renal function in the experimental setup. In our study, DMSA scintigraphy confirmed the GFR results and determined that the pretreatment with everolimus improved the renal function recovery following ischemia, while tacrolimus had no such effect. To date, there are only two experimental studies addressing the effect of everolimus on renal I/R injury, and both studies failed to show a substantial improvement in renal function. Suyani et al used a similar protocol to our study, administering everolimus or saline to rats for seven consecutive days prior to the renal I/R injury. They found that everolimus had beneficial effects on cytokines and oxidative stress, but serum creatinine remained high and histology did not improve with everolimus. In another study, Martinez-Palli et al investigated the effect of donor pre-conditioning with cyclosporine, everolimus or a combination of both in a rat renal transplantation model. They found no difference between the immunosuppressive pre-conditioning versus no pre-conditioning in terms of renal function (serum creatinine), necrosis, oxidative stress and cellular damage markers. Screening of metabolic markers revealed nephrotoxic effects in the cyclosporine-pre-conditioned kidneys, whereas everolimus did not have such effects and partly ameliorated cyclosporine nephrotoxicity when coadministered. In contrast, our study presents GFR and DMSA scintigraphy evidence, suggesting that everolimus may preserve renal function after ischemic injury. As with all the experimental studies, there was one limitation of this study that the effects of everolimus and tacrolimus on ischemic renal tissue may not be consistent between rats and humans. Although everolimus gave promising results in this study, further experimental and clinical studies are required to better understand its effect on the ischemic kidney before it can be used in clinical practice. In conclusion, within the confines of this rat warm ischemia model, everolimus pre-treatment was useful in preserving the renal function following an I/R injury. The possibility of using everolimus as a pre-conditioning agent for the I/R injury in kidney transplantation should be further explored. 1. Perico N, Cattaneo D, Sayegh MH, Remuzzi G. Delayed graft function in kidney transplantation. Lancet 2004;364:1814-27. 2. Emiroglu R, Yagmurdur MC, Karakayali F, et al. Role of donor age and acute rejection episodes on long-term graft survival in cadaveric kidney transplantations. Transplant Proc 2005; 37:2954-6. 3. Senel FM, Karakayali H, Moray G, Haberal M. Delayed graft function: Predictive factors and impact on outcome in living-related kidney transplantations. Ren Fail 1998;20:589-95. 4. Boom H, Mallat MJ, de Fijter JW, Zwinderman AH, Paul LC. Delayed graft function influences renal function, but not survival. Kidney Int 2000;58:859-66. 5. Giral-Classe M, Hourmant M, Cantarovich D, et al. Delayed graft function of more than six days strongly decreases long-term survival of transplanted kidneys. Kidney Int 1998;54:972-8. 6. Howard RJ, Pfaff WW, Brunson ME, et al. Delayed graft function is associated with an increased incidence of occult rejection and results in poorer graft survival. Transplant Proc 1993;25:884. 7. Quiroga I, McShane P, Koo DD, et al. Major effects of delayed graft function and cold ischaemia time on renal allograft survival. Nephrol Dial Transplant 2006;21:1689-96. 8. Requiao-Moura LR, Durao Mde S, Tonato EJ, et al. 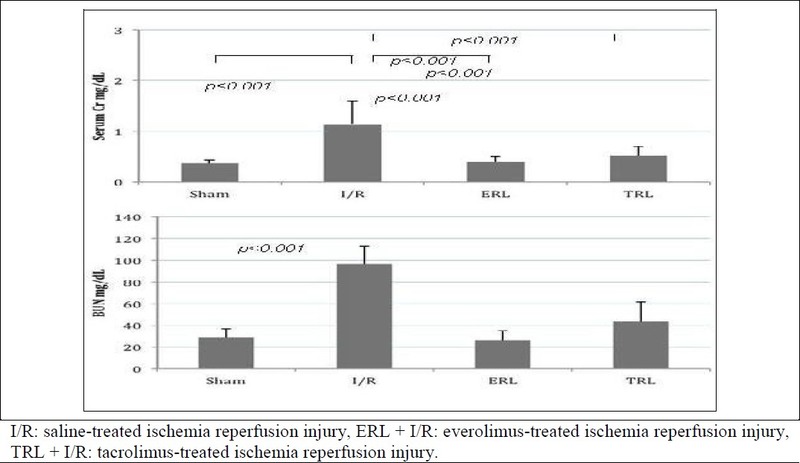 Effects of ischemia and reperfusion injury on long-term graft function. Transplant Proc 2011;43:70-3. 9. Yarlagadda SG, Coca SG, Formica RN Jr, Poggio ED, Parikh CR. Association between delayed graft function and allograft and patient survival: A systematic review and meta-analysis. Nephrol Dial Transplant 2009;24:1039-47. 10. Naesens M, Kuypers DR, Sarwal M. Calcineurin inhibitor nephrotoxicity. Clin J Am Soc Nephrol 2009;4:481-508. 11. Flechner SM, Kobashigawa J, Klintmalm G. Calcineurin inhibitor-sparing regimens in solid organ transplantation: Focus on improving renal function and nephrotoxicity. Clin Transplant 2008;22:1-15. 12. Sakr M, Zetti G, McClain C, et al. The protective effect of FK506 pretreatment against renal ischemia/reperfusion injury in rats. Transplantation 1992;53:987-91. 13. Singh D, Chander V, Chopra K. Cyclosporine protects against ischemia/reperfusion injury in rat kidneys. Toxicology 2005;207:339-47. 14. Yang CW, Ahn HJ, Han HJ, et al. Pharmacological preconditioning with low-dose cyclosporine or FK506 reduces subsequent ischemia/ reperfusion injury in rat kidney. Transplan­tation 2001;72:1753-9. 15. Kawamura J, Hosokawa S, Yoshida O. Renal function studies using 99mTc-dimercaptosuccinic acid. Clin Nucl Med 1979;4:39-46. 16. Klawitter J, Klawitter J, Kushner E, et al. Association of immunosuppressant-induced protein changes in the rat kidney with changes in urine metabolite patterns: A proteo-metabonomic study. J Proteome Res 2010;9:865-75. 17. Lott DG, Russell JO, Khariwala SS, Dan O, Strome M. Ten-month laryngeal allograft survival with use of pulsed everolimus and anti-alphabeta T-cell receptor antibody immunosuppression. Ann Otol Rhinol Laryngol 2011; 120:131-6. 18. Yüzbaºıoğlu MF, Aykas A, Kututas EB, Şahinkanat T. Protective effects of propofol against ischemia/reperfusion injury in rat kidneys. Renal Fail 2010;32:578-83. 19. Cacciarelli TV, Sumrani NB, Hong JH, Chen CK, Sommer BG. Influence of the timing of FK 506 (Tacrolimus) administration on recovery of renal function from warm ischemic injury in rats. ASAIO J 1994;40:964-7. 20. Nalesnik MA, Lai HS, Murase N, Todo S, Starzl TE. The effect of FK 506 and CyA on the Lewis rat renal ischemia model. Transplant Proc 1990;22:87-9. 21. Goncalves GM, Cenedeze MA, Feitoza CQ, et al. The role of immunosuppressive drugs in aggravating renal ischemia and reperfusion injury. Transplant Proc 2007;39:417-20. 22. Fuller TF, Freise CE, Serkova N, Niemann CU, Olson JL, Feng S. Sirolimus delays recovery of rat kidney transplants after ischemia-reperfusion injury. Transplantation 2003;76: 1594-9. 23. Cicora F, Lausada N, Vasquez DN, et al. Protective effect of immunosuppressive treatment before orthotopic kidney autotransplantation. Transpl Immunol 2011;24:107-12. 24. Esposito C, Grosjean F, Torreggiani M, et al. Sirolimus prevents short-term renal changes induced by ischemia-reperfusion injury in rats. Am J Nephrol 2011;33:239-49. 25. Inman SR, Davis NA, Olson KM, Lukaszek VA, McKinley MR, Seminerio JL. Rapamycin preserves renal function compared with cyclosporine A after ischemia/reperfusion injury. Urology 2003;62:750-4. 26. de Lange MJ, Piers DA, Kosterink JG, et al. Renal handling of technetium-99m DMSA: evidence for glomerular filtration and peritubular uptake. J Nucl Med 1989;30:1219-23. 27. Provoost AP, Van Aken M. Renal handling of technetium-99m DMSA in rats with proximal tubular dysfunction. J Nucl Med 1985;26: 1063-7. 28. van Luijk WH, Ensing GJ, Meijer S, Donker AJ, Piers DA. Is the relative 99mTc-DMSA clearance a useful marker of proximal tubular dysfunction? Eur J Nucl Med 1984;9:439-42. 29. Kwak W, Jang HS, Belay T, et al. Evaluation of kidney repair capacity using 99mTc-DMSA in ischemia/reperfusion injury models. Biochem Biophys Res Commun 2011;406:7-12. 30. Suyani E, Derici UB, Sahin T, et al. Effects of everolimus on cytokines, oxidative stress, and renal histology in ischemia-reperfusion injury of the kidney. Ren Fail 2009;31:698-703. 31. Martinez-Palli G, Hirose R, Liu T, et al. Donor pre-treatment with everolimus or cyclosporine does not reduce ischaemia-reperfusion injury in a rat kidney transplant model. Nephrol Dial Transplant 2010;26:1813-20.